Just in time for the 2017 holidays season, eBay has announced the launch of their guaranteed delivery program allowing buyers the option of searching for millions of listings eligible for guaranteed delivery dates. This new program will allow sellers to commit to a delivery date for domestic orders with the option of one to four business days for delivery. Qualified eBay sellers will have the option to opt into the guaranteed delivery program starting August 2, 2017. Sellers interested in this new program can join with no extra fees or complicated processes making it a critical tool leading up to the holiday season. The Handling Time Option - This option is best for sellers who ship from one location. 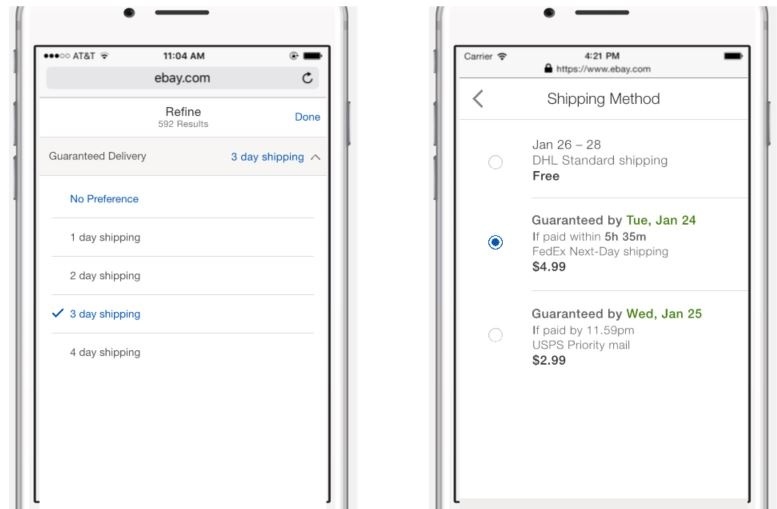 To use this option, sellers will need to have a seller level of above standard or above, 0-1 days handling time, offer returns and use eBay labels. This option lets eBay figure out the delivery date for you and guarantees delivery. eBay will cover the shipping cost refund for late arrivals or free return label if the seller meets the handling time. The Door-to-Door Option - This option is great for sellers who ship from multiple locations and need full control of delivery dates. For sellers to use this option, they are required to have a seller level of above standard or above and offer returns. This option lets sellers control the guaranteed delivery date based on regional rate tables. The seller will be required to cover the shipping cost refund or return labels. eBay is hosting a free Guaranteed Delivery Webinar August 9, 2017. To register, click here.